Thousands of supporters of President Hosni Mubarak today attacked anti-government protesters as fresh turmoil gripped Egypt. Backers of the president, who last night agreed to relinquish his grip on power, fought with the crowds in Cairo’s Tahrir (Liberation) Square, injuring more than 600 people. Some rode into the ranks on horses and camels while wielding whips. In chaotic scenes, they pelted each other with stones, large sticks and machetes. The death toll since protests began eight days ago is now thought to be as high as 300, according to Navi Pillay, the UN High Commissioner for Human Rights. 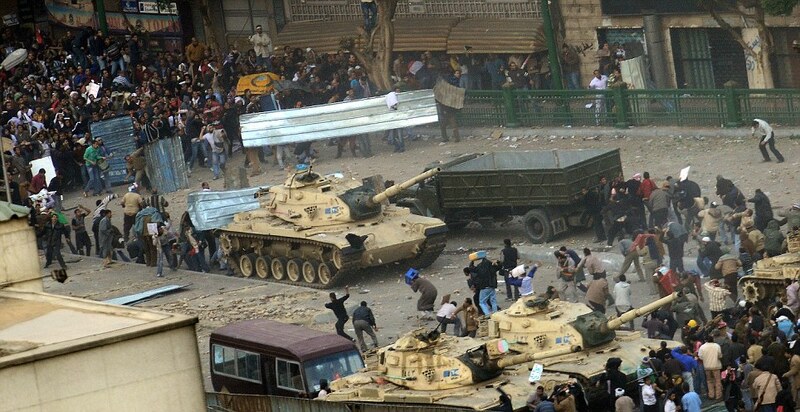 Reports to the world body from nongovernmental sources in Egypt also suggest that more than 3,000 people have been injured. Many of those who demonstrated in support of the regime today are believed to be secret police in plain clothes. 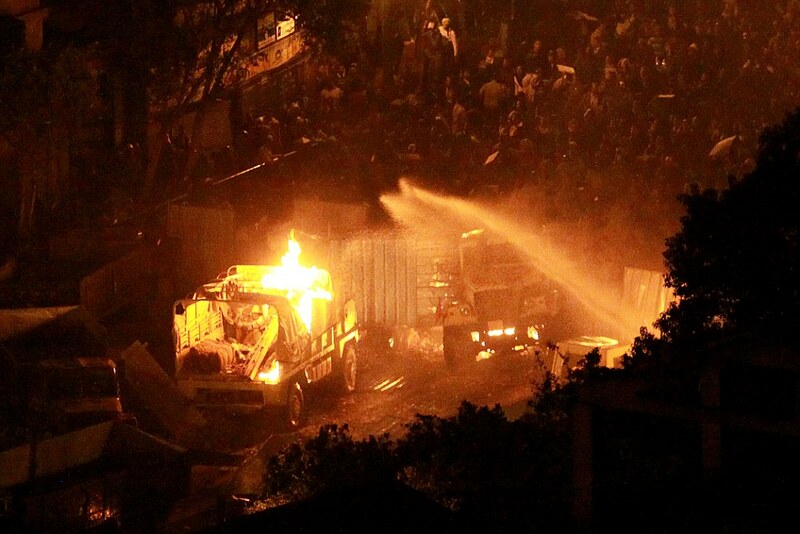 There were reports that concrete blocks has been hurled on pro-democracy protesters. The army has stood by and refused to intervene so far. But there are growing fears that there will be a massacre. Opposition leader Mohamed ElBarawi said that Mr Mubarak was using ‘scare tactics’ to stay in power. ‘I’m extremely concerned. My fear is that it will turn into a bloodbath,’ he said. The White House said the U.S. was ‘deeply concerned’ about the attacks on media and peaceful demonstrators. The morning – the eighth day of protest – began peacefully enough with a fresh round of protests in Tahrir Square. But for the first time thousands of Mr Mubarak’s supporters descended on the massive public space, the scene of a yesterday’s 250,000 strong demonstration. Around 3,000 supporters of the 82-year-old leader were seen breaking through a human chain of anti-government protesters as they tried to defend the thousands gathered in the Square. Chaos erupted as they tore down banners denouncing the president and fistfights broke out as they advanced across the plaza. The two sides started hurling stones, bottles and sticks at each other and gave chase. At one point, some pro-Mubarak forces rushed in on horses and camels swinging whips and sticks. Protesters retaliated – dragging them from their horses and throwing them to the ground then beating them. People were seen running with their shirts and faces bloodied while some men and women in the crowd wept. Tear gas was believed to have been deployed, though it was not clear who had fired it. The demonstrations appeared to be the start of an attempt by Mr Mubarak’s three-million strong National Democratic Party to retake momentum from protesters demanding Egypt’s nearly 30-year ruler step down immediately. In a broadcast last night, he had promised to step down at elections in December. But his opponents say that this is simply not soon enough. Egypt’s band of opposition parties, including the banned Muslim Brotherhood, have begun to coalesce around the figure of Mohamed El Baradei, a Nobel Peace laureate for his work as head of the UN nuclear agency. Yesterday in Cairo, effigies of Mr Mubarak were hung from lamp-posts, as people screamed for him to quit, likening him to Hitler and a donkey. Khaled Osman, 40, a tourist guide from Aswan, said: ‘I am so happy that the old man has finally given up. But he must go now. And we will stay here campaigning until he goes. ‘The game is over, he knows that.’ Tourist guide Mohammed Al Gawad, 33, from Hurghada, said: ‘We have had enough of his brutality. We want to be free. ‘We want to decide our own destiny. And we want jobs. These are the things that Mubarak has not given us. He just stole our money.’ Cairo’s international airport was a scene of chaos as thousands of foreigners sought to flee the unrest, and countries around the world scrambled to send in planes to fly their citizens out. Some tourists even reported being forced to pay bribes to policemen before being permitted to board what planes did manage to take off. An estimated 18,000 were still stuck there yesterday, although many British citizens and other holidaymakers in Sharm el Sheikh and the Red Sea resorts are staying put. Even having a ticket was no guarantee that tourists could get on a flight, it has emerged. ‘People holding tickets had difficulties getting on the plane, because the airport in Cairo is pure chaos,’ Canadian tourist Tristin Hutton said Tuesday after his plane landed at Germany’s Frankfurt airport. ‘The terminals are full of panicking people. The ground staff is disappearing, and at the gate, just before entering, we all together had to collect $2,000 for a policeman at the door… He would not let us pass without paying. Internet service also began returning to Egypt after days of an unprecedented cutoff by the government, and state TV said authorities were easing a nighttime curfew, which now runs from 5pm to 7am instead of 3pm to 8am. The various protesters have little in common beyond the demand that Mubarak go. Perhaps the most significant tensions among them is between young secular activists and the Muslim Brotherhood, which wants to form an Islamist state in the Arab world’s largest nation. The more secular are deeply suspicious as the Brotherhood aims to co-opt what they contend is a spontaneous, popular movement. American officials have suggested they have similar fears. 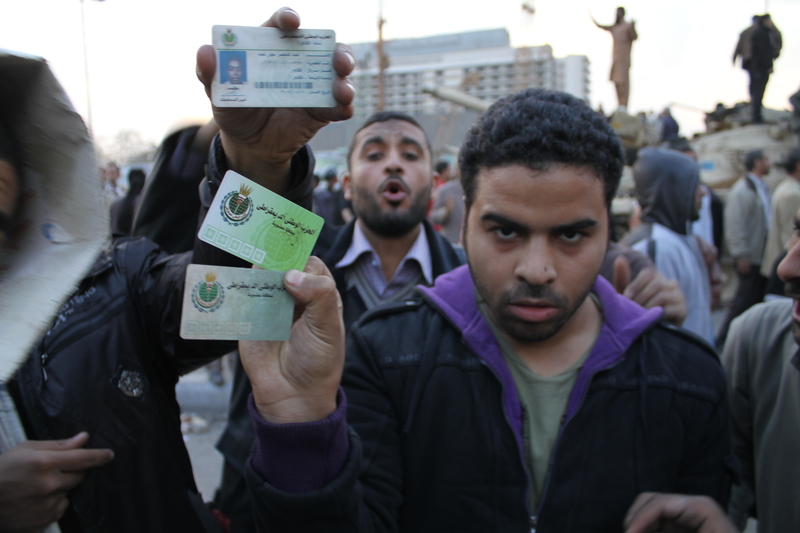 The outlawed Muslim Brotherhood remains Egypt’s largest opposition movement. In a nod to the suspicions, Brotherhood figures insist they are not seeking a leadership role. ‘We don’t want to harm this revolution,’ Mohamed Mahdi Akef, a former leader of the group. In chaotic scenes, the two sides pelted each other with stones, and protesters dragged attackers off their horses. This is the first significant violence between supporters of the two camps in more than a week of anti-government protests. It erupted after President Mubarak went on national television on Tuesday night and rejected demands he step down immediately and said he would serve out the remaining seven months of his term. On Wednesday morning, a military spokesman appeared on state television and asked the protesters to disperse so life in Egypt could get back to normal. The announcement could mark a major turn in the attitude of the army, which for the past two days has allowed protests to swell, reaching their largest size yet on Tuesday when a quarter-million peace packed into Cairo’s central Tahrir Square. Nearly 10,000 protesters massed again in the square on Wednesday morning, rejecting President Mubarak’s speech as too little too late and renewed their demands he leave immediately. In the early afternoon, an Associated Press reporter saw around 3,000 Mubarak supporters break through a human chain of anti-government protesters trying to defend thousands gathered in Tahrir. Chaos erupted as they tore down banners denouncing the president. Fist fights broke out as they advanced across the massive square in the heart of the capital. The anti-government protesters grabbed Mubarak posters from the hands of the supporters and ripped them. The two sides began hurling stones and bottles and sticks at each other, chasing each other as the protesters’ human chains moved back to try to shield the larger mass of demonstrators at the plaza’s centre. At one point, a small contingent of pro-Mubarak forces on horseback and camels rushed into the anti-Mubarak crowds, swinging whips and sticks to beat people. Protesters retaliated, dragging some from their mounts, throwing them to the ground and beating their faces bloody. Protesters were seen running with their shirts or faces bloodied, some men and women in the crowd were weeping. A scent of tear gas wafted over the area, but it was not clear who had fired it. The army troops who have been guarding the square had been keeping the two sides apart earlier in the day, but when the clashes erupted they did not intervene. 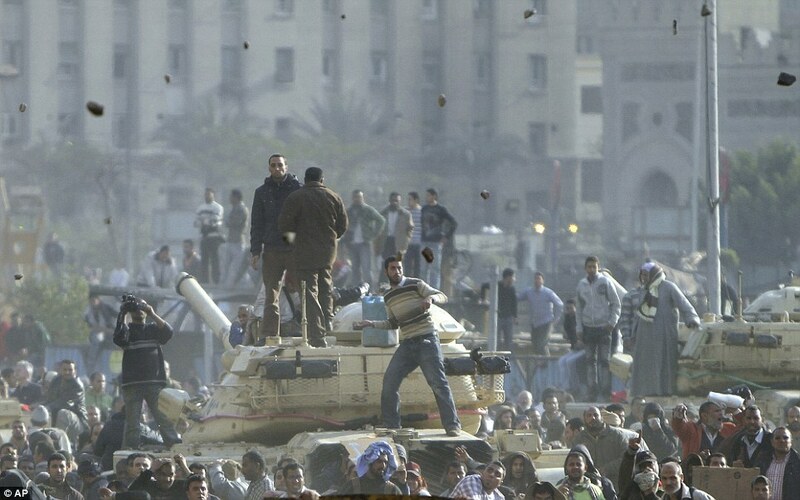 Most took shelter behind or inside the armoured vehicles and tanks stationed at the entrances to Tahrir.